Warnakali is a PADI dive center located above Toyapakeh harbor in Nusa Penida. 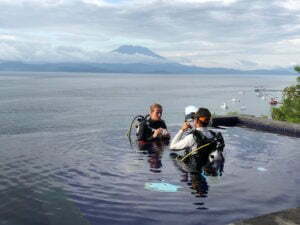 Its location, facilities and instructors make it a unique place to practice scuba diving in Bali. Warnakali Dive Center opened in Nusa Penida in August 2017. Its ambition, till the beginning was to reach the highest level of satisfaction for scuba divers, in safe conditions. Warnakali swimming pool is emblematic of the ambition of the center. Its design meets all the objectives of professional scuba diving courses and amazing fun dives. The pool is divided in two parts. In shallow water people who never dived get used to the equipment. And breathe for the first time underwater. The 3-meter deep part of the pool is very important for a complete initiation before going at sea. Because the first meters are the most important to properly equalize the pressure in the middle ear with the outside pressure underwater. And when you master all the exercises in the reassuring setting of a pool, you enjoy even more your diving at sea ! It would be a shame not to enjoy diving with Manta rays because you were poorly prepared, would’t it ? The pool is also more than 10 meter long because some of the PADI courses require this length.You will develop basic scuba skills in a pool for your Open Water Course. And you will practice some of the exercices in the pool before doing them at sea. The swimming pool is also key to reactivate the licence of divers who have not been diving for a long time. The pool also offers an exceptional setting for relaxation in Nusa Penida. It is perched on a hill overlooking Lembogan Strait. To the east, an incredible view of Mount Agung. To the west, incredible sunsets. So even for those who do not wish to take the plunge, the place is worth the trip. 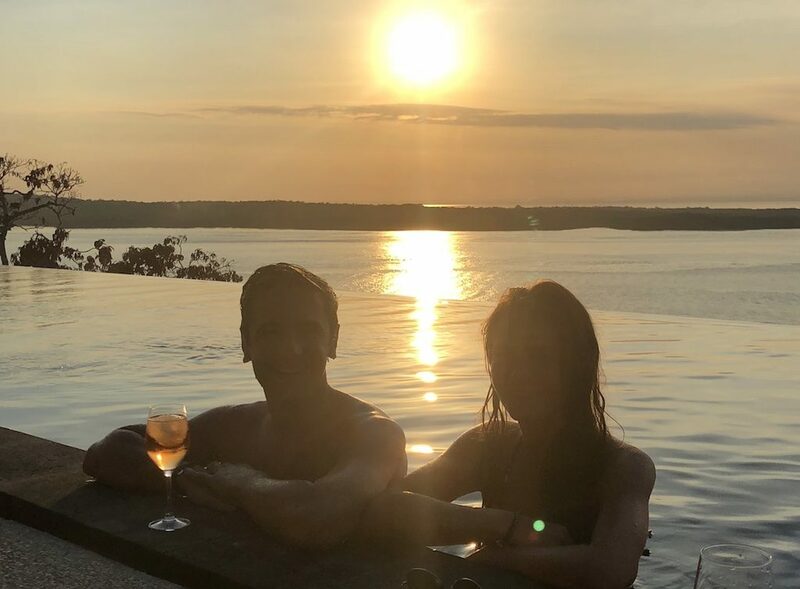 The dive center organizes sunset aperitifs. It consists of an introduction to scuba diving with a discovery dive in the pool followed by an aperitif at sunset and a dinner. A very romantic experience if you travel as a couple! 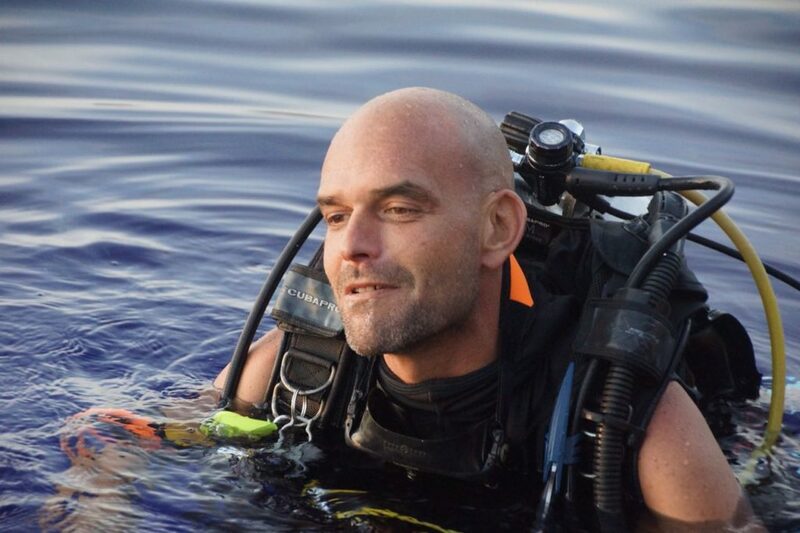 Yann, the manager of Warnakali, has accumulated more than 4000 dives in Bali, including 2500 in Nusa Penida. He has dived more than 600 times to Crystal Bay, the most emblematic dive site in Nusa Penida, because this is where you try to meet the famous Mola Mola from August to October. Nusa Penida dive spots are world famous, but they are also pretty technical. The currents can indeed be quite intense in Nusa Penida. So diving with an instructor who knows the least characteristic of each dive site is an important asset. Guarantee of a successful dive where you will see the max you can hope for while being in total safety. And a guarantee of successful training whether you come for a discovery dive, a PADI certification or a more advanced course. The center recently certified a rescue diver who completed all her training after she originally was only looking after a snorkeling session with Manta rays ! New and well maintained equipment is an important key for nice fun dives. But the dive center also has all the necessary equipment to dive safely. Including two essential equipment for safety : a radio and an oxygen kit on board of the boat. Apart from diving or after diving ? Warnakali has just opened its restaurant. 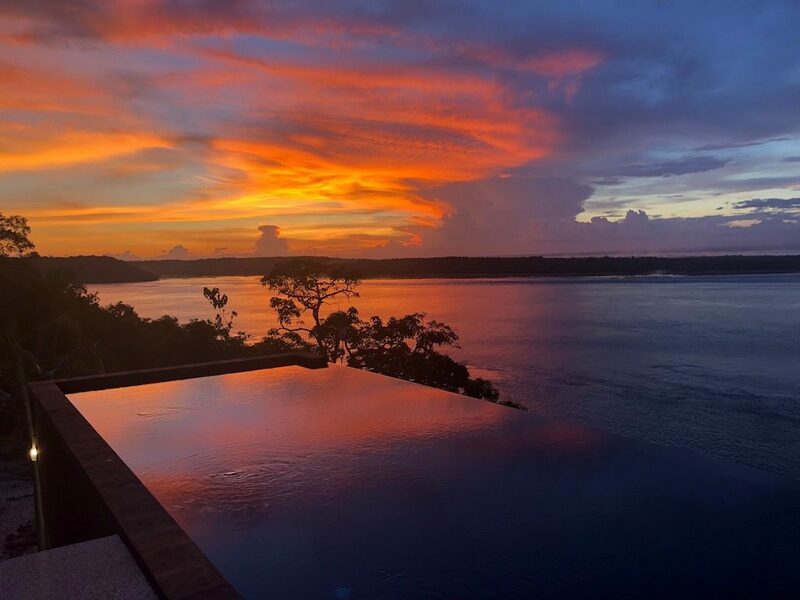 You can therefore come and enjoy the sunset and the rest of the evening in an exceptional setting. On reservation only, to preserve the uniqueness of the experience. Compose your menu, choose your drinks and let yourself be carried away by the magic of the place to the sound of the playlist specially concocted by Yann. So check out Warnakali’s website and send them a contact message !